Frank Breton and Neetol Rahman in F***'d Til Payday. BOTTOM LINE: F***’d 'Til Payday is a meta-narrative dark comedy about life, love, and loneliness; the creators' earnest commitment to telling their stories their way will make you sit back and take notice. From the first moment of F***’d 'Til Payday (Unrequited Truth), in which creators and stars Neetol Rahman and Francisco “Frank” Breton address the audience with a welcome and deadpan introduction, it is clear that the show operates with an absurdist, dark comedic perspective and is unafraid to break many of the traditional structures of theater. Originally performed earlier this year at the People’s Improv Theater (PIT), F***’d Till Payday is an autobiographical meta-narrative that focuses on the themes of love and loss. Two friends, Neetol and Frank, work dead-end jobs at Pioneer’s Bar, a real-life favorite of improv comedians that is located on 29th Street. Through a non-linear narrative and a number of breakout raps/spoken word poems, F***’d 'Til Payday explores what it means to be a young person dealing with everyday—but nevertheless devastating—tragedies. The show lands like a dark comedy sketch show, with a number of tonally different scenes connected by the thread of friendship and the pain experienced by the two leads. It belongs in a smaller and more intimate space than its luxuriously large Fringe venue. Many scenes feel aimless and reduced in such an open space, and characters are left wandering without a directed sense of movement. Scenes are separated into different “chapters," designated by a visual projection that includes a relevant quote and an aphoristic title describing the themes of the upcoming scene. These transitions are accompanied by actor Luis Nuñez as he, somewhat unnecessarily, sets the scene. In fact, after about four of these transitions, Nuñez himself interrupts his own announcement—and gets laughs— by saying, “Oh, you get it," but then he returns to the pattern for the rest of the show. Scenes from F***’d 'Til Payday vary in focus and punch, but a few stand out. “Existential Crisis Hotline” features Breton and another actor, Grayson Sandford, staffing the aforementioned hotline while drinking beers and seeming generally disinterested. There are a few funny lines, including a straightforward delivery of a joke about existential doom that ends with a cheery “Have a nice day.” A few other moments—including one in which Rahman, a self-described non-alcoholic demisexual virgin, becomes "Ray Mysterioso Jr.,” an alter ego who totally contrasts with his more authentic self—hit with strong comedy timing, but unfortunately these are few and far between. Often, performers seem to chase their lighting, and in a few scenes it is evident that Breton and Rahman (no lighting designer is credited) have fundamentally overestimated the ambiance that low-lighting can provide. At one point Grayson Sandford breaks the fourth wall and comments on the all-red lighting, noting that it makes it look like we’re in an outdoor setting. However for the audience, this dim lighting means that smaller acting choices are lost. The material of the show ranges from light and clever to emotionally demanding, and though there are strong performances, particularly from Sandford and Rahman, often scenes feel flat. Long, drawn-out pauses are used for dramatic tension and would have more impact if Breton and Rahman could tighten the pacing. Ultimately, F***’d 'Til Payday deserves to be applauded for its emotional vulnerability and commitment to challenging the norms of theater, calling attention to the ways in which performance itself is part of our daily lives. In its moments of eye-winking cleverness, it transcends some of its more serious challenges to delight the audience. It is unafraid to be real, with all the messiness that includes. 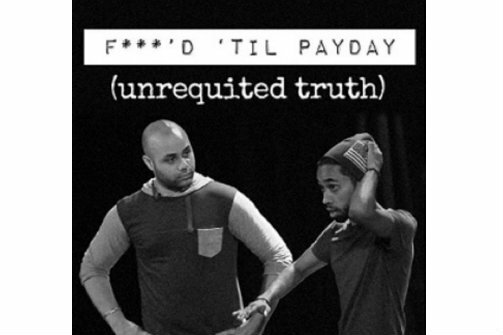 F***'d 'Til Payday (Unrequited Truth) is written and directed by Francisco Breton and Neetol Rahman. The cast is Francisco Breton, Neetol Rahman, Grayson Sandford, Luis Nuñez, Erin Marsz, Neeka Billotte, Amanda Stafford, Sarah Boatright, Pete Staiano, Beth Callen and John Curry.